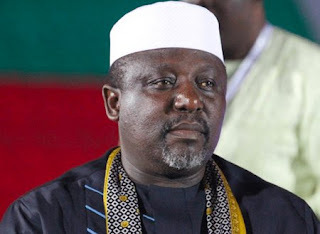 Imo State Governor Rochas Okorocha yesterday lambasted a former National Chairman of the All Progressives Grand Alliance (APGA) and senator representing Anambra Central, Chief Victor Umeh, for allegedly failing to find his feet in the Senate. The governor noted that Umeh’s recent attack on him was a ploy to get cheap popularity, which he said had eluded the senator since he got to the National Assembly. The statement added: “Nigerians have seen that Chief Umeh has not been able to find his feet in the Senate since he was elected into the Upper Chamber of the National Assembly. He has been staggering, thinking about which leg to put forward first. “And for this reason, he has not been getting the kind of media attention he was enjoying free when he held sway as APGA’s National Chairman. “Having been starved of media publicity as a result of his abysmal outing in the Senate, Chief Umeh felt that the only way he could get the needed attention from the media was by attacking Governor Okorocha and unwarranted too, leveraging on the impeachment moves against Deputy Governor Eze Madumere by the House of Assembly. On the genesis of the face-off between the governor and the senator, the statement said: “He has continued to talk about how he made Okorocha governor in Imo in 2011 when he could not do that before 2011 and could not also do that after Okorocha left APGA. And he could not do that in any other state in the Southeast, even in Enugu, which is closer to him. And in his senatorial zone, the Peoples Democratic Party (PDP) had produced the senators until he came up recently. “Chief Umeh should justify his trip to the Senate. Attacking Okorocha won’t be an acceptable justification for his inaction. His zone is being ravaged by erosion. He can begin with a motion on that. And nothing stops him from engaging a consultant since one does not give what he does not have.